Recounting a story of cut-throat Chicago salesmen, four desperate employees seek to sell the most real estate by all means necessary. Lies, Greed. Corruption. It’s all business as usual for Glengarry Glen Ross. Any star spotting? The show stars plenty of TV famous faces, including Mark Benton (Northern Lights, Waterloo Road) and Nigel Harman (EastEnders, Mount Pleasant). What’s the big deal? 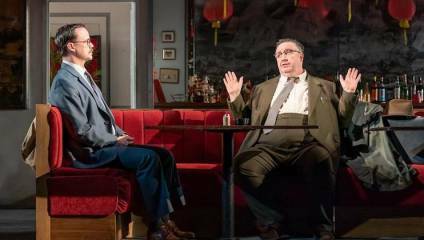 David Mamet’s original play Glengarry Glen Ross has been a West End and Broadway hit, winning a Tony award, New York Drama Critics’ Circle award and Pulitzer Prize. The show was also made into a film in 1992, and since its creation in 1982 has been revived multiple times. Based on Mamet’s experiences in the US real estate industry it follows the attempts of four realtors who must try and sell undesirable property to unwitting buyers. With superb television talent on stage in Brighton, this triumphant play will be brought to life once again. What do I need to know? An off the wall comedy show from celebrated comedian and Edinburgh Comedy Award-winner Adam Riches. Every night boasts a different show, and combines character creation, stand-up comedy and plenty of audience participation. Adam Riches has been on Comedy Central’s Drunk History and Channel 4’s 8 out of 10 Cats does Countdown and The Last Leg (to name a few). What do I need to know? 90’s Britpop legends Suede released their eighth studio album The Blue Hour last year and have continued to tour well into 2019. Having made music since ’89, Brett Anderson and co have a wealth of songs to fall back on and having been out since September 2018 fans will no doubt recognise songs from their newest album. What do I need to know? An outrageously camp show in which ‘renowned homosexual’ Julian Clary bares his soul in the form of a comedy show and overall performance. He promises to murder some of your favourite songs and offers an extract from his next memoir A Night at the Lubricant. His website teases that this could be Clary’s final mince, so be sure not to miss it. What do I need to know? Australian singer songwriter Stella Donnelly writes frankly about damaging male cultures in her self-release ‘Boys Will Be Boys’, and is bringing her delicate, sing-songy tunes to audiences in the UK.